Awoke to a beautiful day on which to finish our wonderful journey. 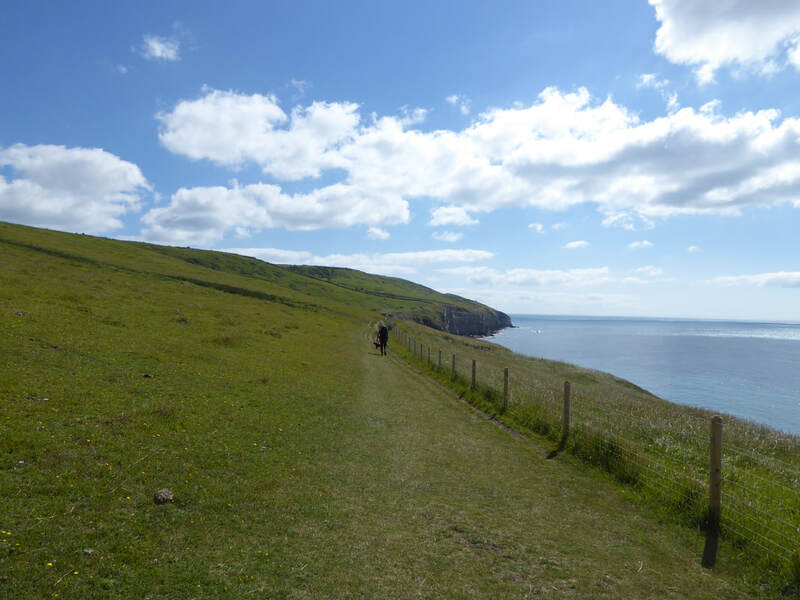 It felt strange packing up the rucksacks for the last time knowing our time on the path was coming to an end. We had a long day in the heat ahead but were looking forward to a section of the route which probably had a bit of everything. 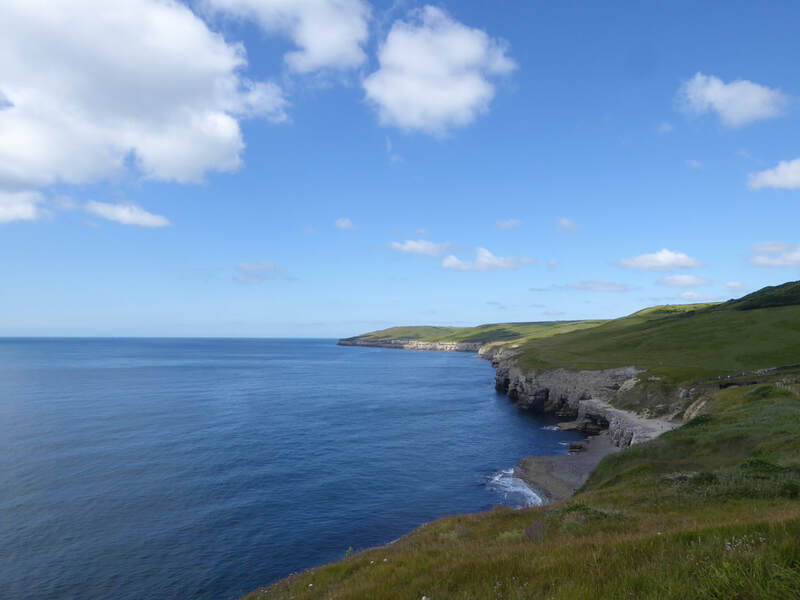 Our B&B in Worth Matravers was excellent - large and comfortable with a super breakfast to top it off. 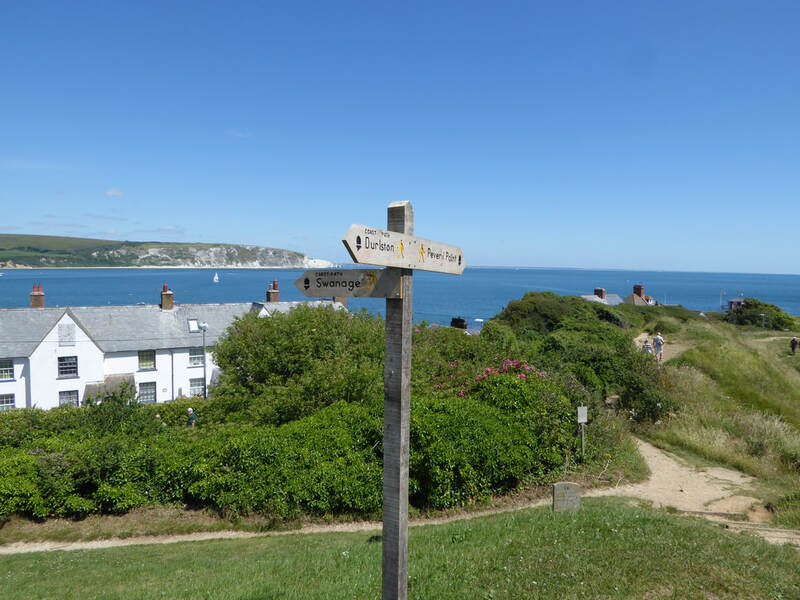 The village itself is a delight but the pub is a tad odd - just serves pasties and you queue for your beer in a passageway - ok for a visit but that's it. 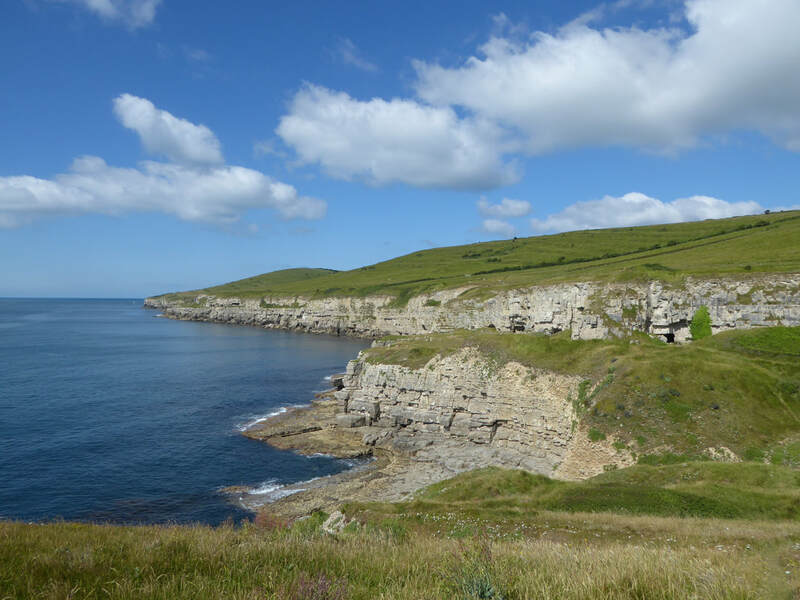 We headed back to the path via field paths to Seacombe Cliff - already it was baking hot as we headed over the magically named Dancing Ledge. 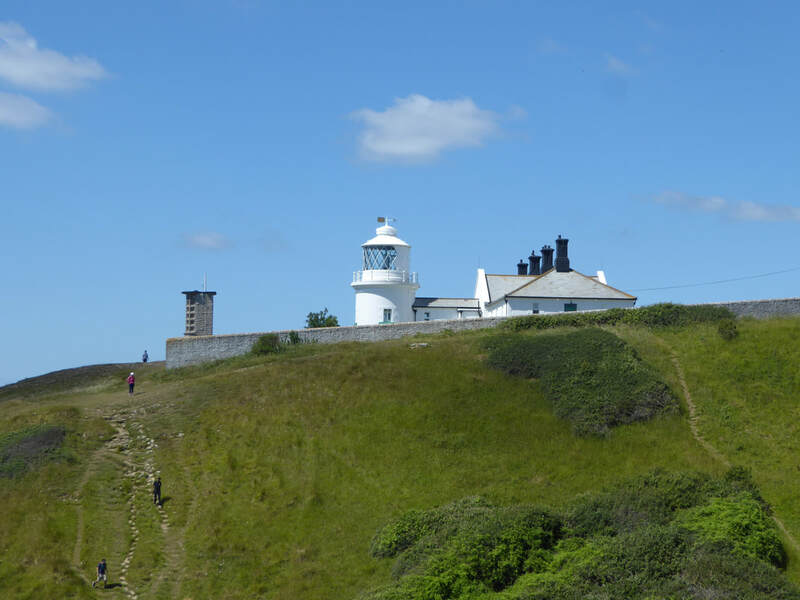 Reaching Anvil Point & Durlston Head the walking traffic became busier - mainly because this is such a beautiful spot and the weather was so good. 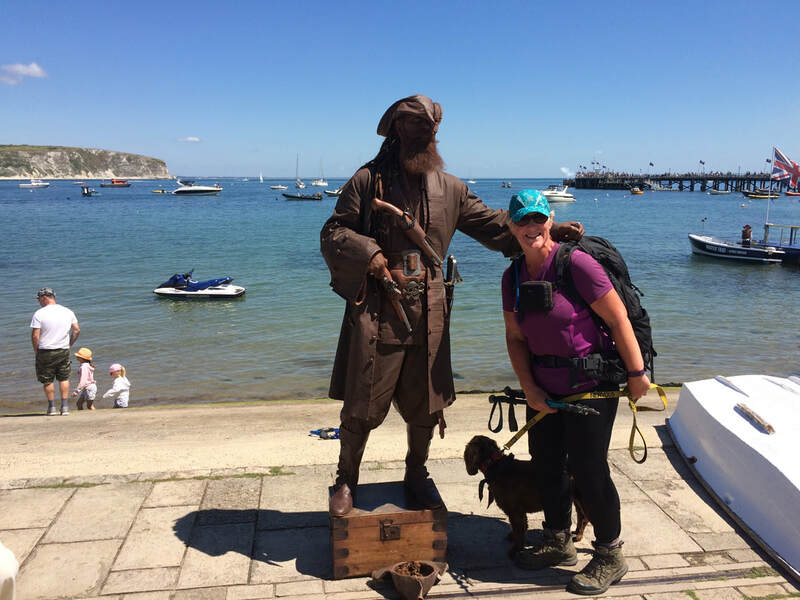 The descent into Swanage was another super stretch and we could hear gunfire coming from the Harbour - arriving in the town we soon realised there was a Pirate Festival going on and the place was heaving with Pugwash lookalikes. We rested up at one of the many cafes in the town and then met up with Nick who had walked ahead of us. 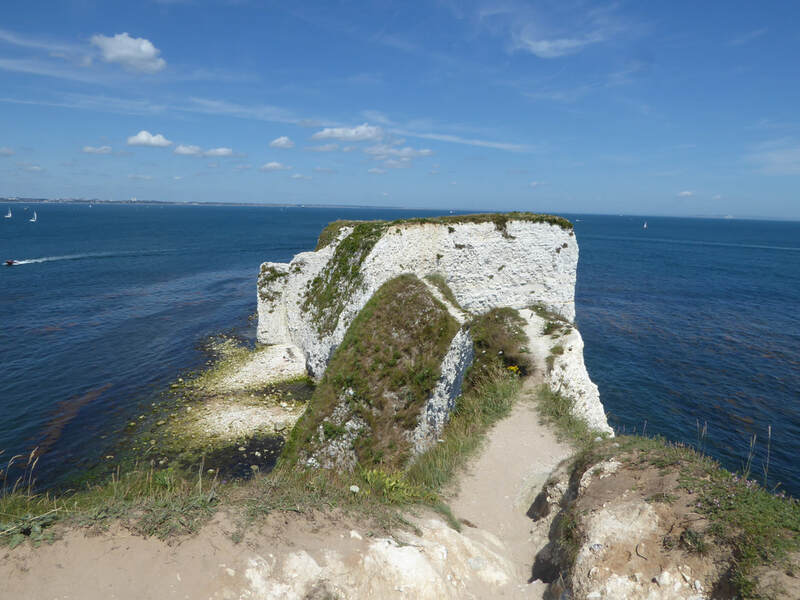 We then completed our last real climb of the walk as we chugged up Studland Hill to reach Ballard Point from where we could see Old Harry Rocks ahead of us. 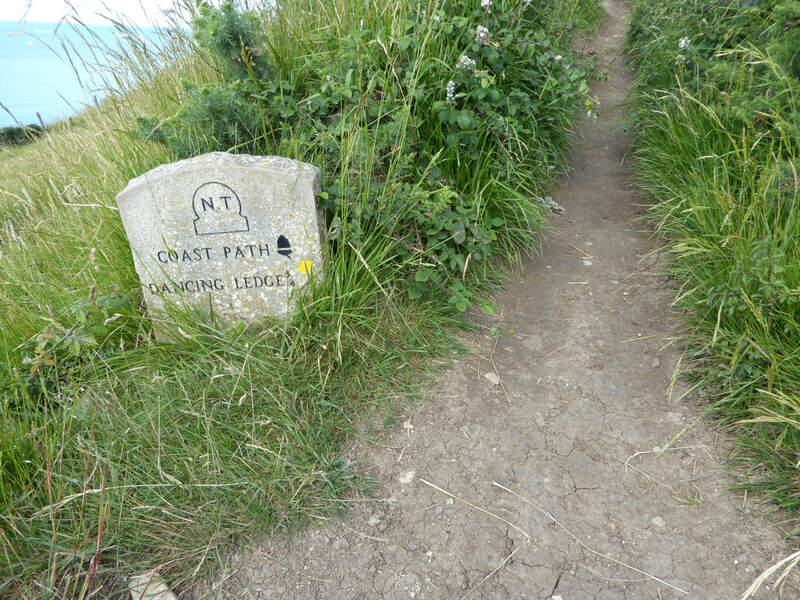 The transit between these two points was fantastic walking on a grassy swathe - it was like walking on carpet. 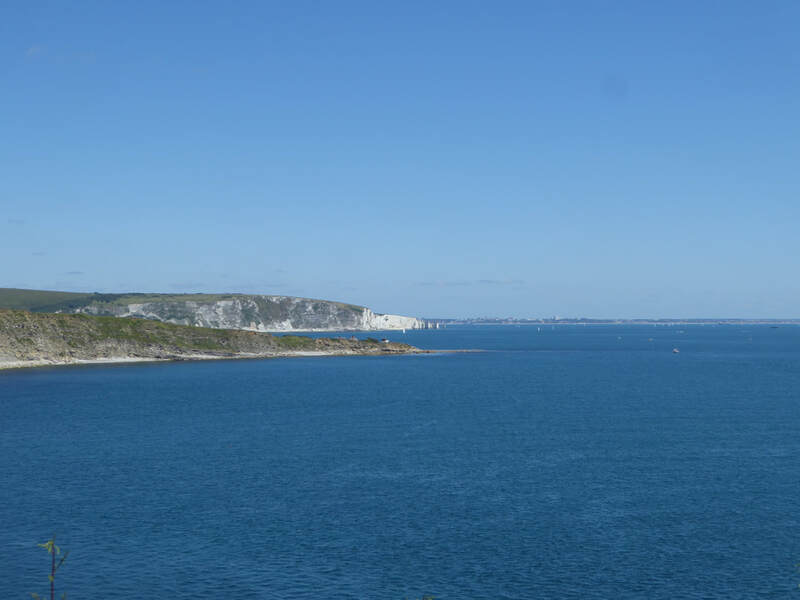 Arriving at Old Harry Rocks there were superb views over to the Isle of Wight and we took our time wandering about here before moving on to Studland. We managed to get a seat at Joe's Cafe at the southern end of Studland Beach for a drink before making our way the final 3 or so miles right along the shore line - this was great for Fudge as he could keep cool but it was a big effort dodging in and out the way of the many people enjoying the beach - Nick had gone ahead to meet us at the finish. 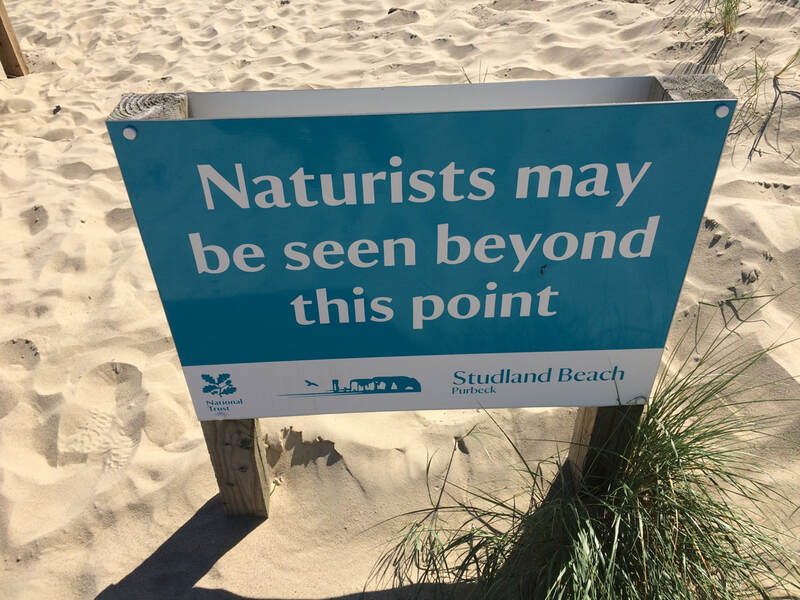 We were already aware that there was a section of the beach at Studland which provided for Naturists but nothing prepares you for some of the sights - there was a lot of stuff hanging out that needed ironing and it wasn't beach towels either. 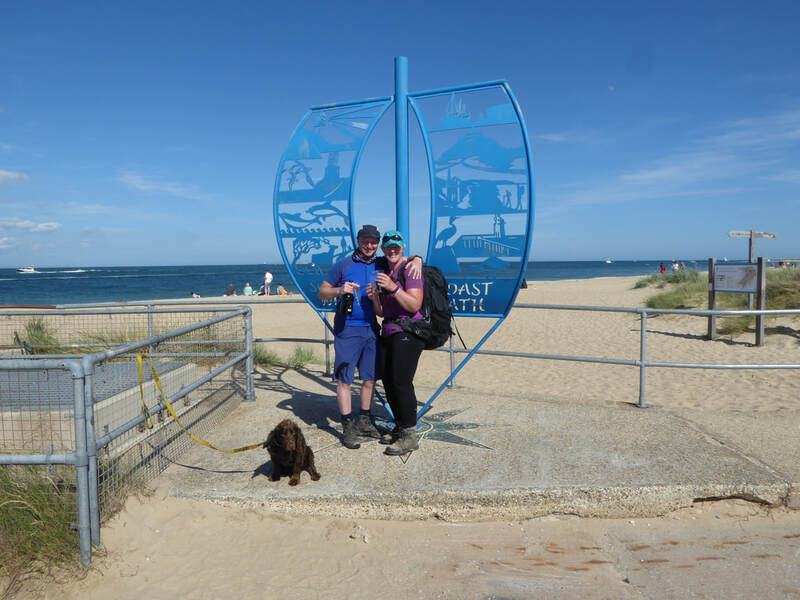 Soon enough we spotted the finish and made our way over to the South West Coast Path marker which is right next to the Sandbanks Ferry embarkation road. 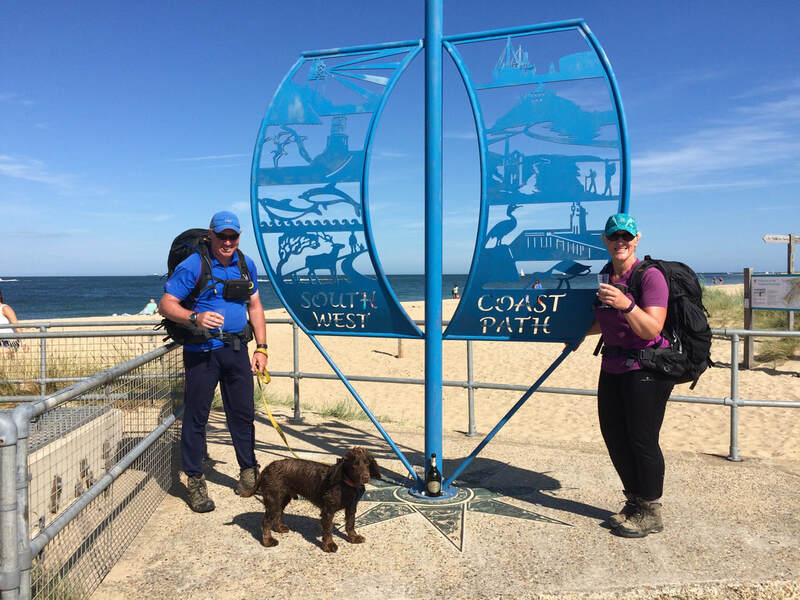 Nick was waiting for us at the finish and provided our welcoming committee - big hugs and handshakes all round as we completed this epic walk. 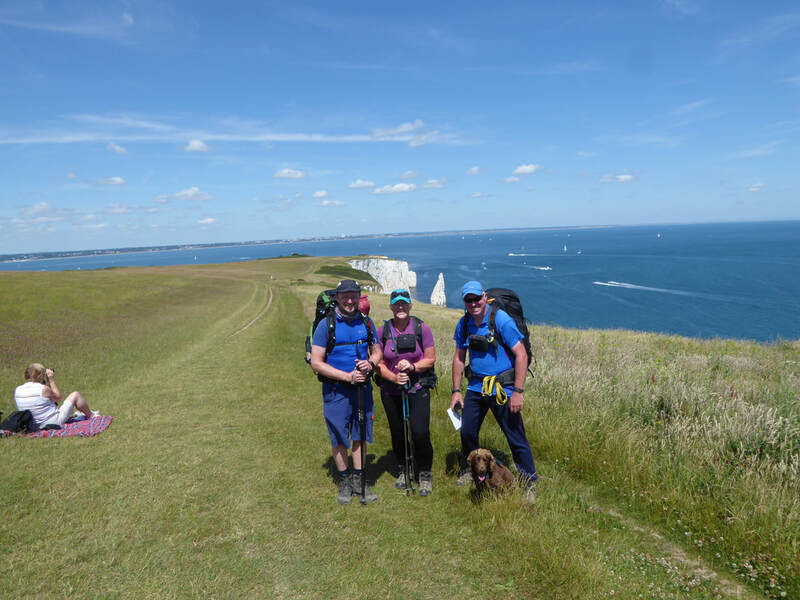 No fanfare, big reception or marching bands - just a really good walking mate who had taken the time out to walk with us over the last 3 days and even provided the bubbly to celebrate with - thanks Nick. 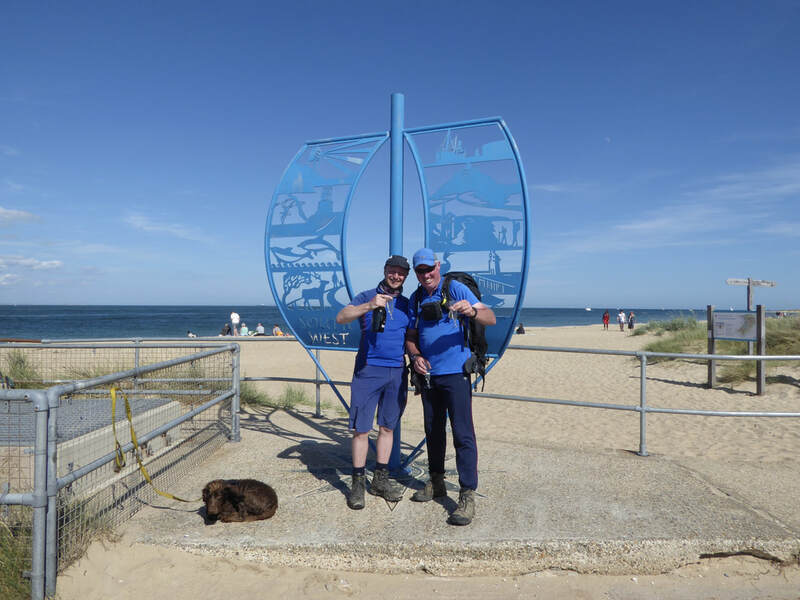 This had been a fantastic experience which will remain long in the memory - 675.4 miles (including accommodation & route detours etc) of superb walking. 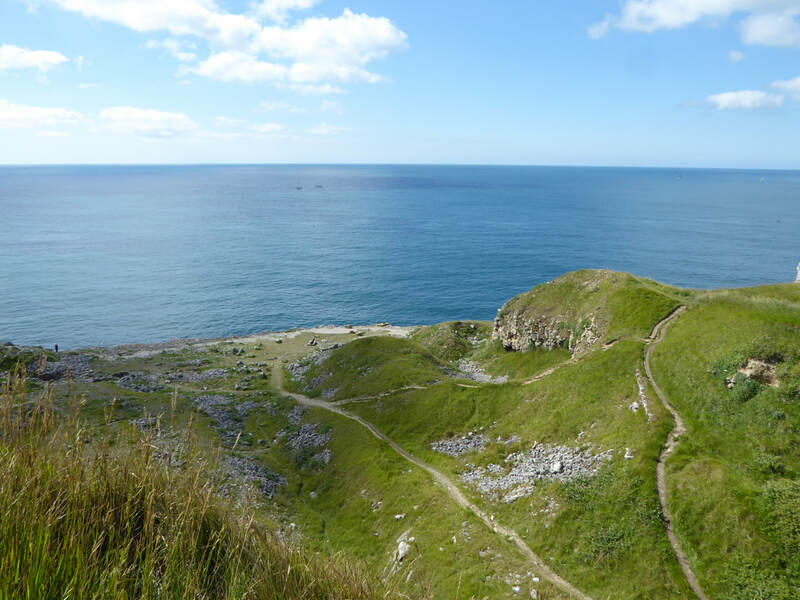 The scenery and length of the walk are a big part of the experience but so are the people you meet and the highs & lows you have along the way. 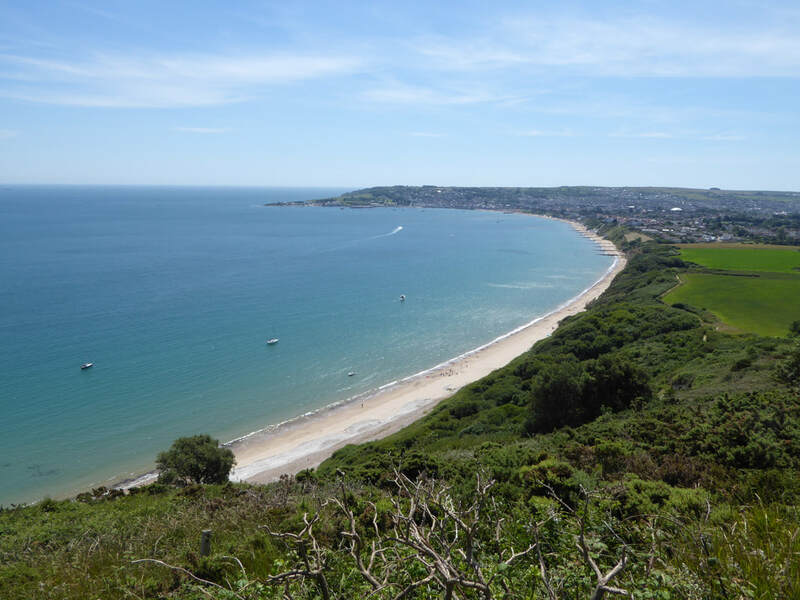 With the celebrations over with we caught the ferry to Sandbanks and a little further up the road called a taxi to take us to our B&B at Sarnia Cherie in Poole. That evening we dined alfresco in Poole with Nick which was a fitting end to a memorable 54 days. 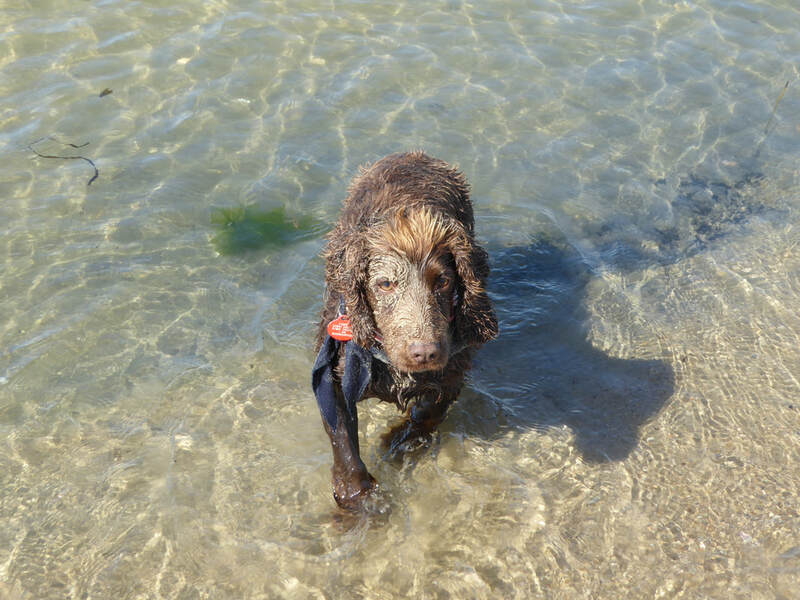 The following morning we said goodbye to our hosts at Sarnia Cherie who very kindly gave us £20 for Fudge's Charity, Spaniel Aid. 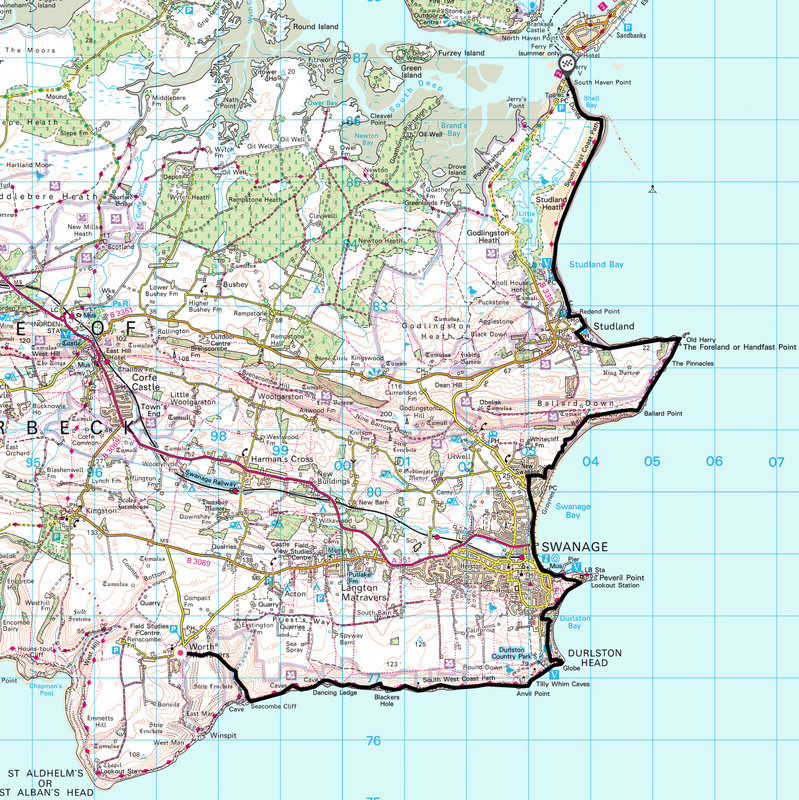 All that was left to do was to make our way to the Railway Station in Poole to catch the train back to Angie's Mums. 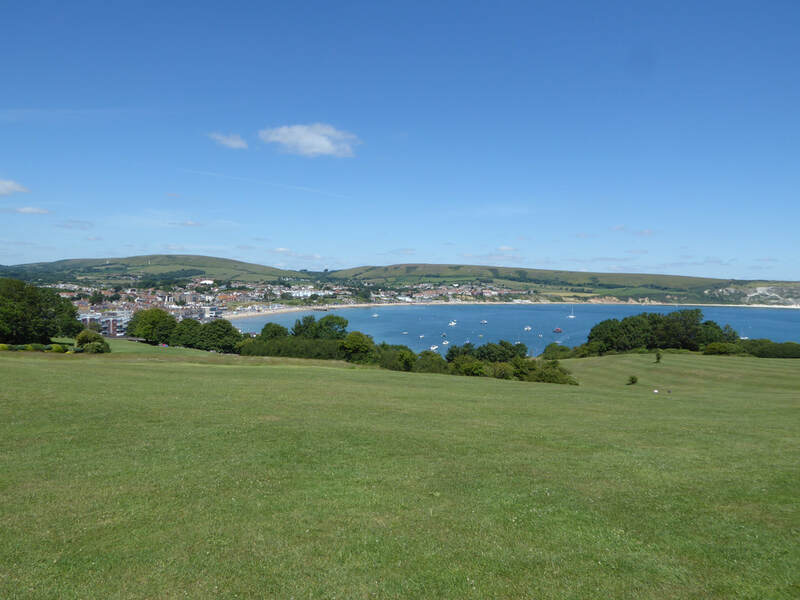 We bade Nick farewell at Weymouth and continued onward to Dorchester from where we caught the bus back to Bridport. 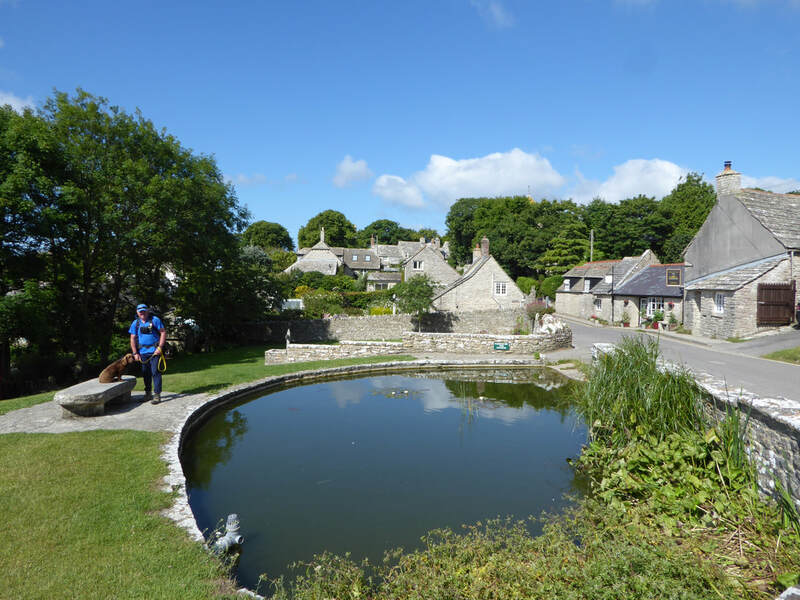 The village pond at Worth Matravers - this really is an idyllic spot. Our B&B is to the right. 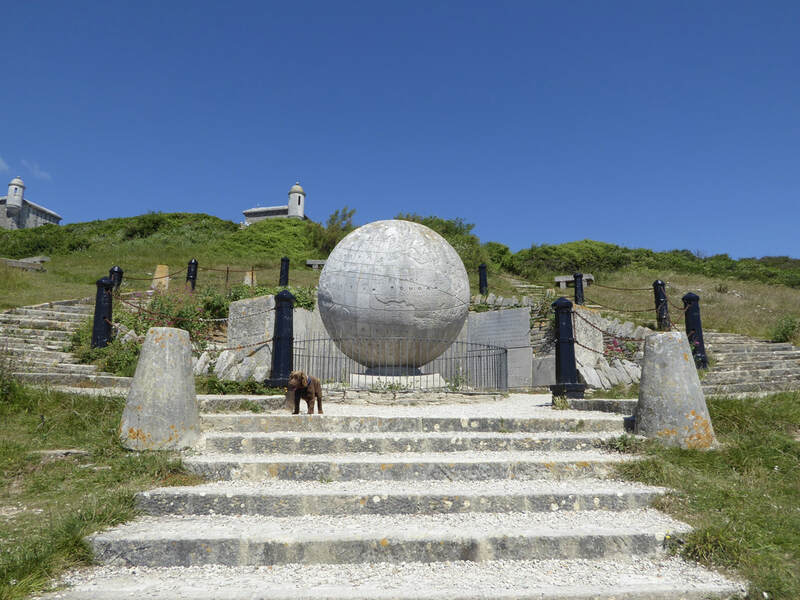 The Great Globe at Durlston Country Park. 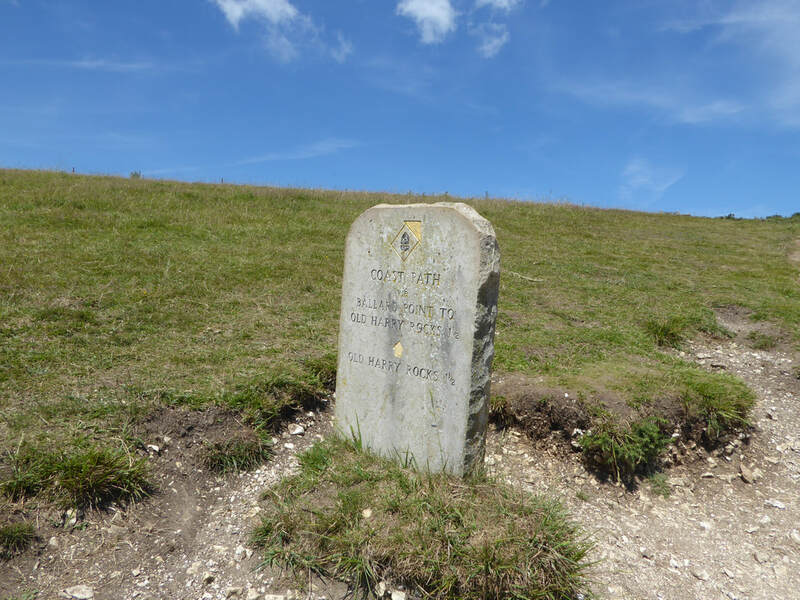 The Globe is one of the largest stone spheres in the world and is constructed of Portland Stone. It weighs about 40 tonnes and is 3 metres in diameter. 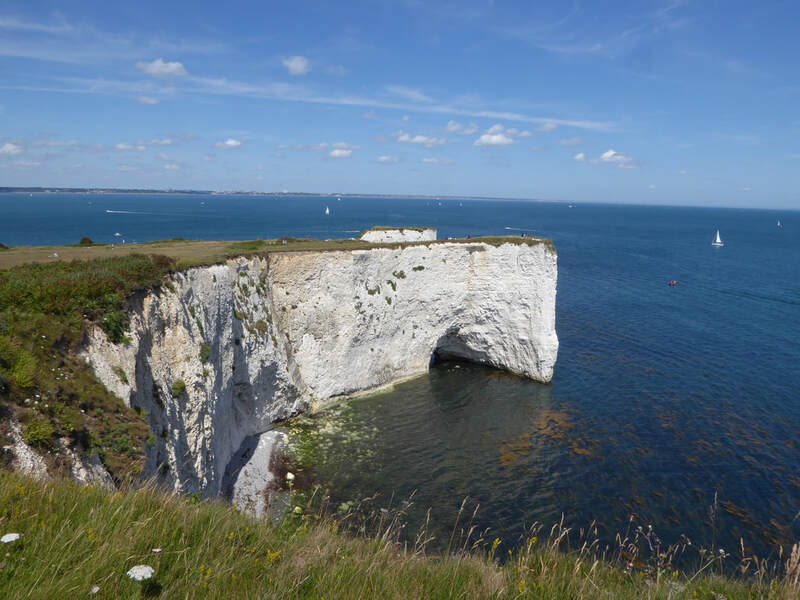 Old Harry Rocks - they consist of three chalk formations, including a stack & a stump. 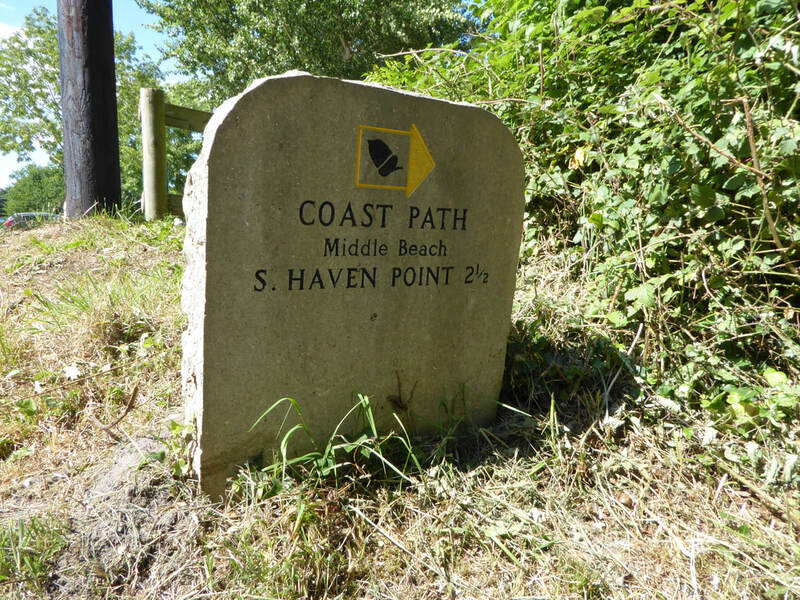 They mark the most easterly point of the Jurassic Coast. 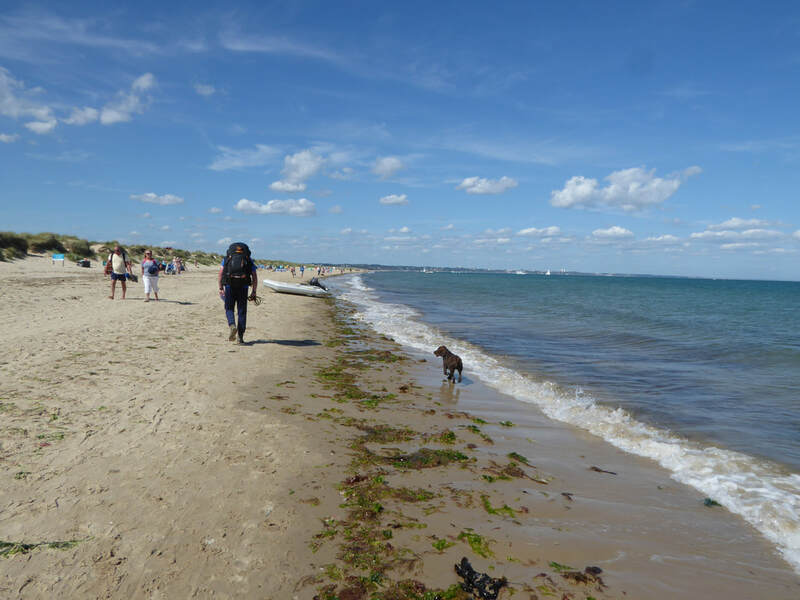 We were about to see some large cracks in the sand - also people were having BBQ's therefore lots of sizzling Chipolatas on show. 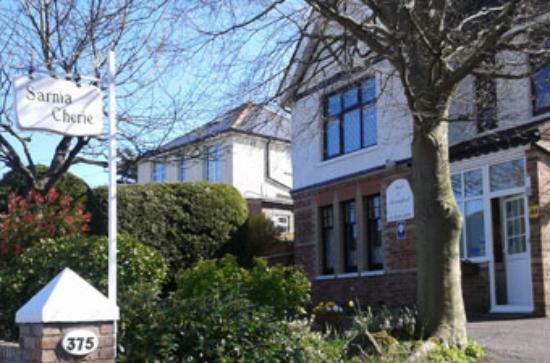 ​All joking aside, we actually saw two old chaps carrying out 'touching your toes' exercises - not pleasant. Team Walsh at the finish - what an epic adventure with my 2 best friends.